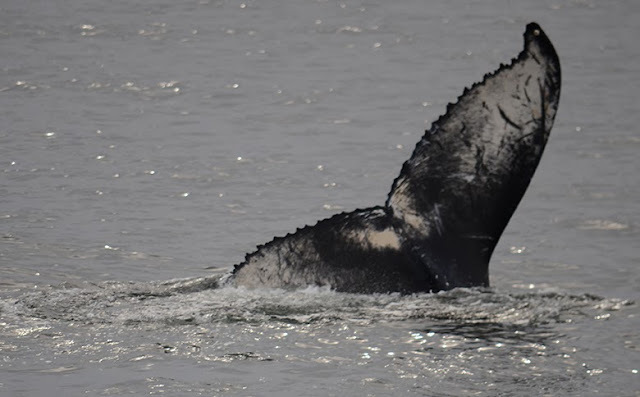 Today on the Cetacea we headed north toward Thacher Island in search of whales. We started off with a quick sighting of a small pod of harbor porpoise off Gloucester. There were also lots of Northern gannets in the area—another good sign! Next we saw a spout up ahead, just north of Thacher Island. The humpback whale fluked in the distance and we were able to quickly identify it as a familiar whale named Echo. We spend a good amount of time with Echo as see was fluking and deep feeding consistently. While observing her, we noticed a pair of humpbacks about a half mile from us, so we moved over to them after great looks with Echo. The pair turned out to be Spar and her calf! Spar’s calf has a distinct injury to her dorsal side, with a bit clipped off her fin, as well as a chunk missing just behind that. These two were deep feeding as well, with varied dive times. Also in the mix was a minke whale about 1/8 of a mile away and approximately three scattered harbor seals! We heard rumors over the radio of a SECOND mother calf pair in the area so we moved a couple miles away to find humpback whale Owl and calf! Owl’s calf was busy rolling and flipper slapping for a small whale watch vessel nearby. It was great for passengers to see different behaviors from a calf in one trip. We got some nice looks at Owl’s fluke and her calf also did a nice tail flick for us. Owl has some deep scarring on her dorsal side. It is unfortunate to see significant scarring on two whales in the same trip, but it is a reminder we share space with them and brings up great discussion on conservation measures. This fall has been excellent and we hope it keeps up for as long as possible!